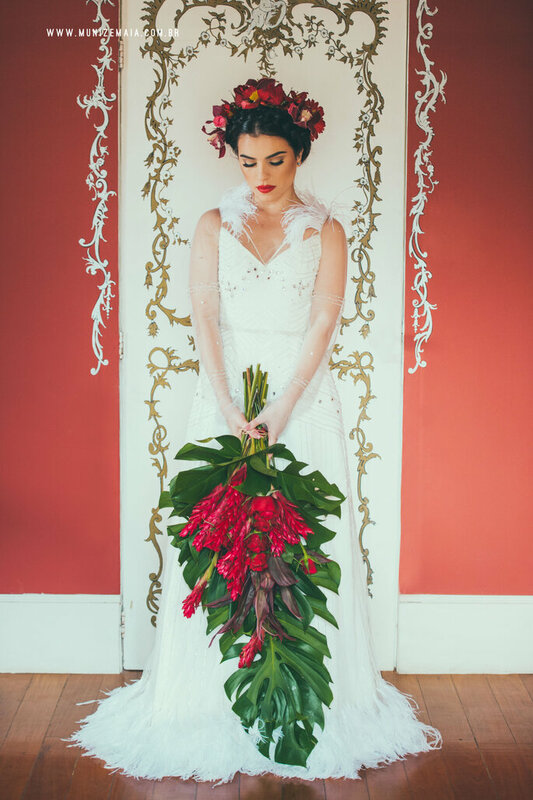 Created to make a visual impact, to show off original patterns, styles and cuts, and decorated with fantastic art; take a look at this Styled Shoot that was inspired by Frida Kahlo, and make your own wedding 100% personalised! 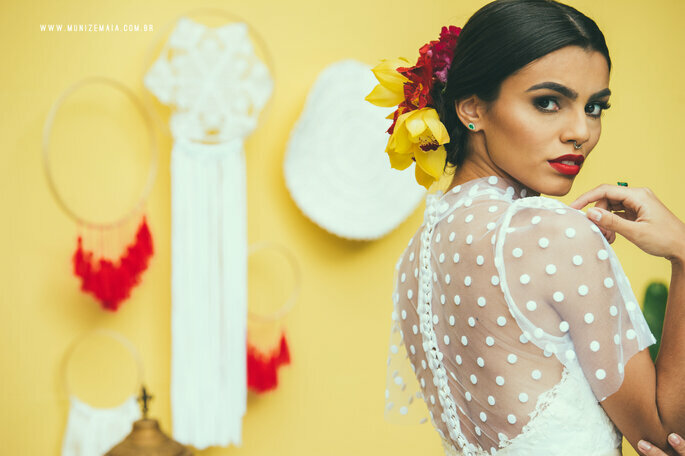 This ‘Chido’ Styled Shoot (a word which means beautiful, beautiful, beautiful in Mexican slang) was created thanks to the talent of the photography duo Muniz y Maia. 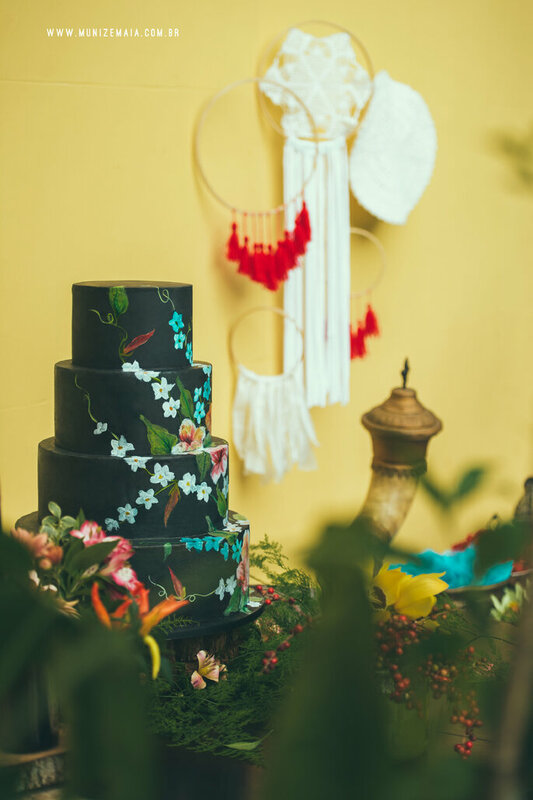 They wanted to do something inspiring in the art world – to take a surrealist tone and apply to it wedding photography, with a bright and unusual mix of colors and prints. 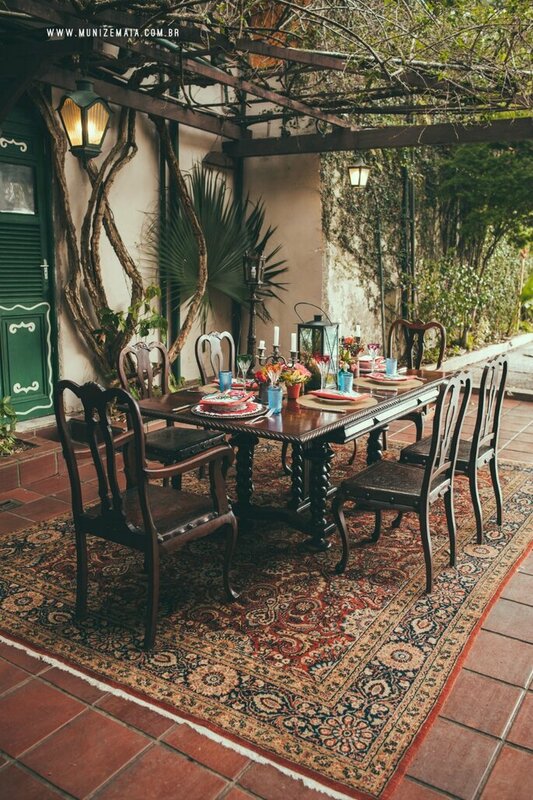 Read on to discover this incredible shoot, and fall in love with the original decor, vintage dresses, and the bold clash of tradition and the contemporary. Of course, when we speak of color, art and originality, there is but one person who immediately springs to mind: Frida Kahlo, and her universally-renowned aesthetic. But what makes Frida Kahlo so special? The Mexican painter – whose full name was Magdalena Carmen Frida Kahlo – was born in Mexico in 1906 (though she would later say 1910, to coincide with the start of the Mexican Revolution), and after a serious accident moved from medicine to artistry. Her work was personal, and as a result, often deeply unsettling, but also reflected who she truly was – her soul went into every painting, alongside visuals from Mexico, the country that she loved. She was a powerhouse of a woman, with a truly original and unique style. 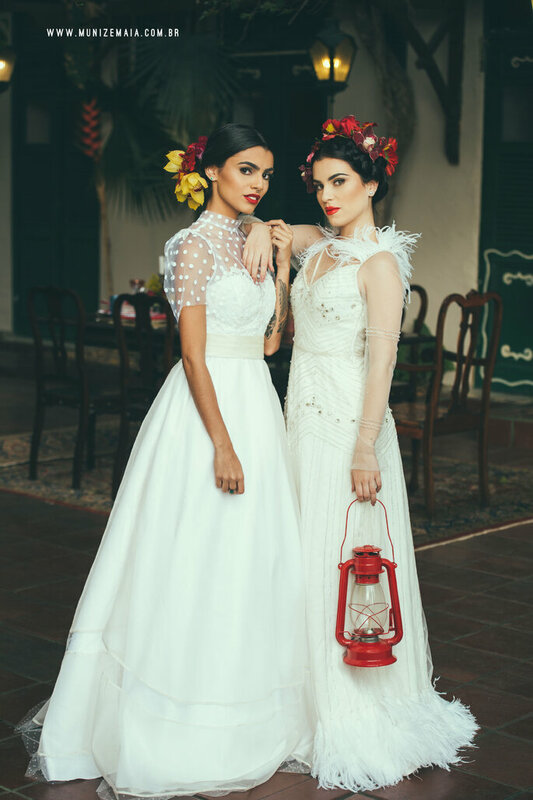 Taking place in the incredible venue of Villa Alejandrinos, the photographers were joined by professionals such as Mel Bessa, who provided the amazing dresses and jewelry, Mariana Castro, who was in charge of hair and makeup for the day, and Luana Zabot with her divine shoes. Other providers and friends also attended to see this idea comes to life! 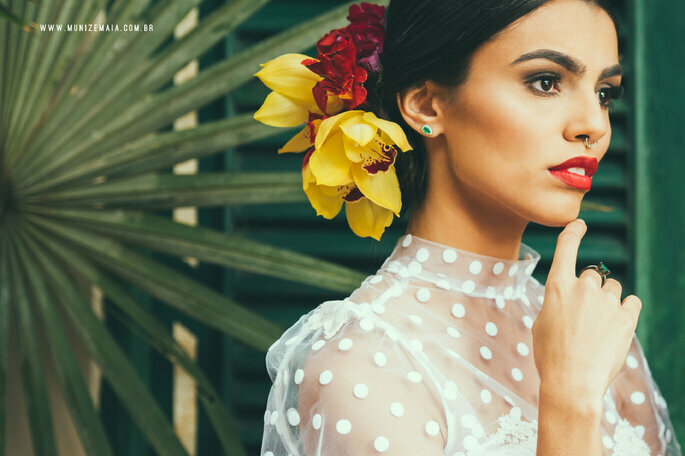 Of course, Frida’s aesthetic was present in all parts of the day – in the long patterned skirts, the intricate braids decorated with colored ribbons and flowers, the exuberant necklaces, and the signature drop-earrings. However, her influence did not end with the fashion on show – but the decor too! 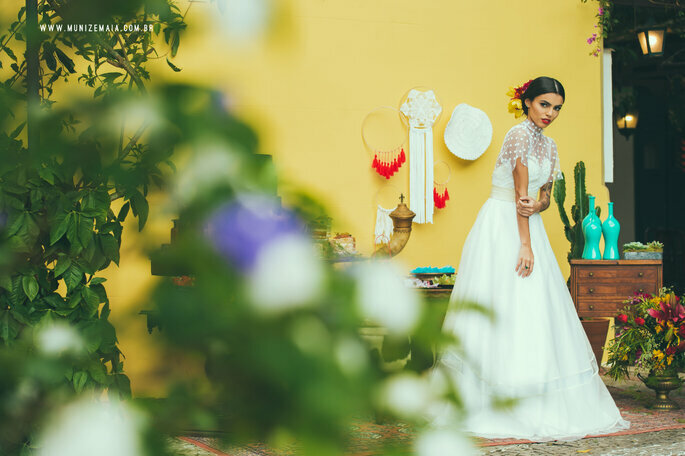 Her house – the Casa Azul, which is now a museum dedicated to her – was a veritable temple of colors and contrasts which reflected the culture and gastronomy of Mexico, and this Styled Shoot replicated this too. 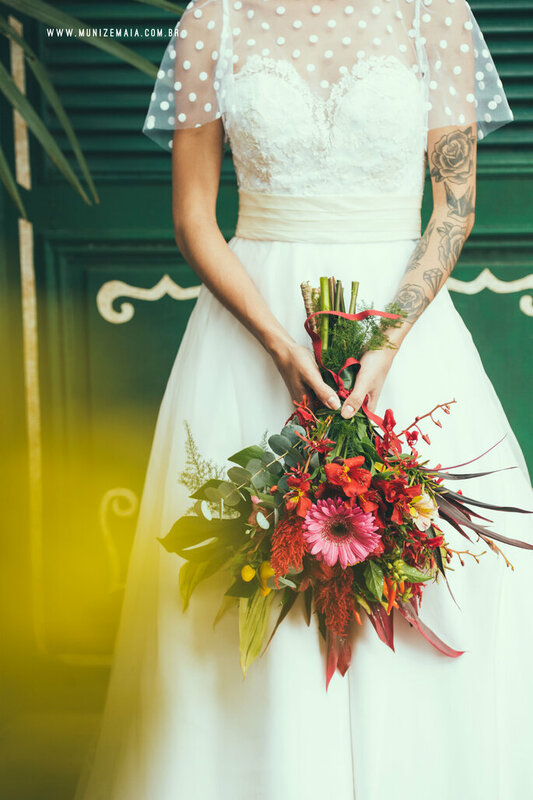 Many brides become nervous at the thought of mixing colors when it comes to the color scheme for their wedding, but when it comes to the details, the decor, and bridal beauty – and when executed well – a diverse palette can be very impressive and tasteful. You will be able to differentiate your wedding from all the rest, and surprise your guests! The ‘chido’ bride is modern, elegant and strong. 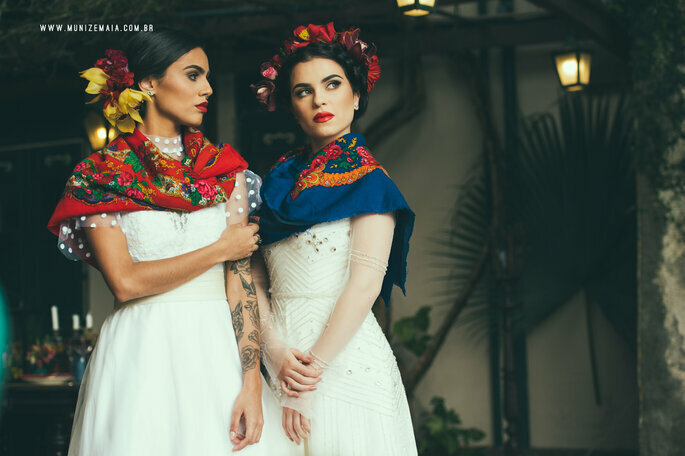 Emulate the incredible Frida Kahlo on your wedding day by personalizing your ceremony and reception 100% – it is totally possible, and will look totally unique. Frida Kahlo was not renowned for her huge interest in conforming to stereotypical feminine attributes and beauty regimes, particularly at a time when Mexican women drew interest from Europe instead of their own culture. Because of her mixed heritage, Frida often felt conflicted about her loyalties (which can be seen in the painting Las Dos Fridas). However, for the modern woman looking for inspiration in her art, the bold colors perfectly fit a bridal makeup palette! We also love the deep blues and reds in the scarves. 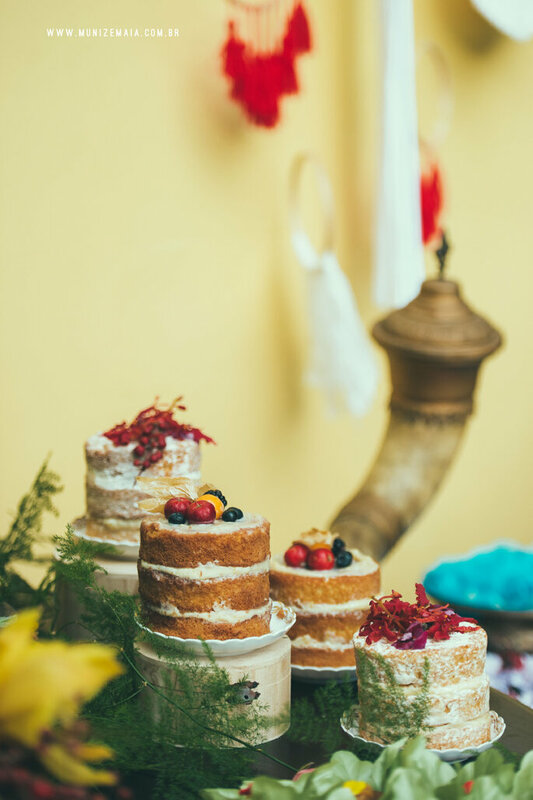 The contrast of red and yellow touches, and some black ones such as in the wedding cake, create an atmosphere that is warm and full of life. 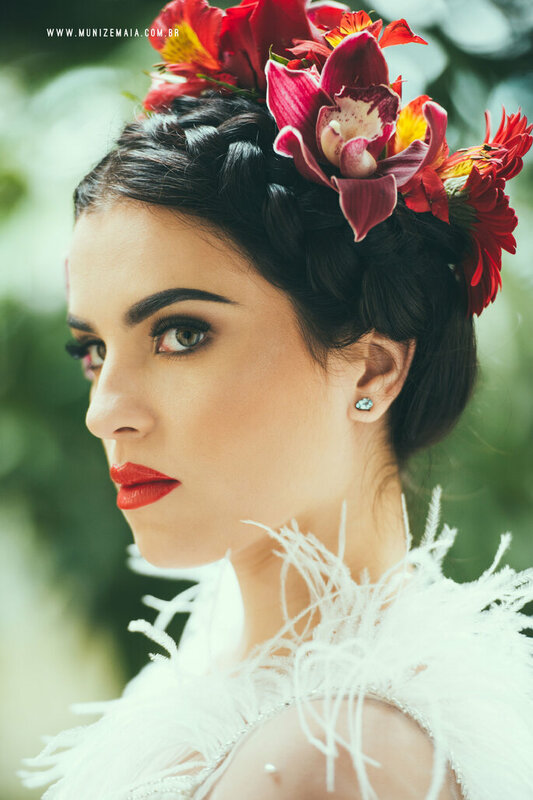 The flowers adorning the models’ hair and the accessories are the perfect complement for the aforementioned bold red lip and tinted eyebrows. For all of you who had never imagined a wedding with so many colors, designs and patterns, this is the chance to move out of the box and create something totally new. Just make sure you are still catering to your own style! We hope you are inspired to go for something a little more unique on your wedding day now! 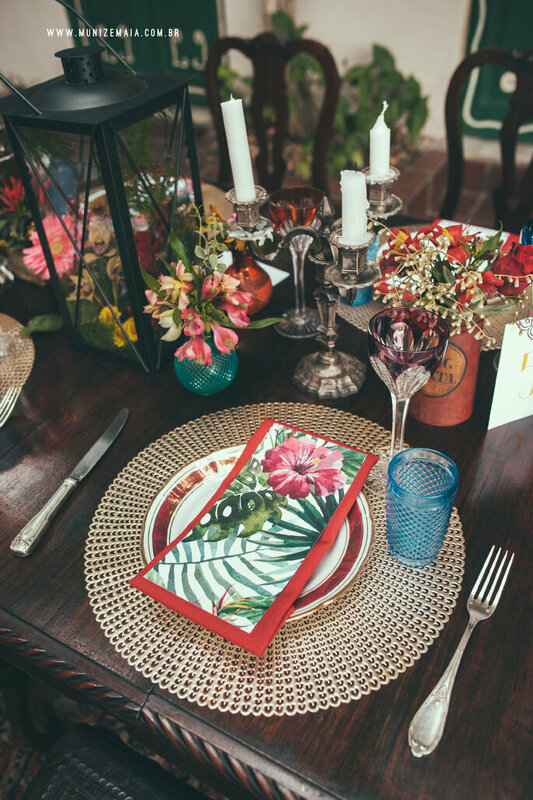 Forget the neutral palettes and the white bouquets, and infuse your wedding with color and bold patterns that are unmistakeably original. Frida Kahlo will live forever because of her art and style – so why not pay homage to one of the world’s greatest artists? Photography: Muniz y Maia | Location: Villa de Alejandría | Decor: Villa Alejandrina | Hair and makeup: Mariana Castro | Cake: Confiserie Lu | Cake: Dulce Delicada | Moulds: Arte en moldes | Flowers and bouquets: Josy Paiva | Dresses and jewelry: Mel Bessa | Shoes: Luana Zabot | Stationery: Artecler | Visuals: Diseño Anfitrión. If you're looking to jazz up your venue, then look no further. Here are 20 inspiring ideas for ceiling decoration that will really impress your guests. Gorgeous glass jars that prove to be super-chic touches for your wedding, whilst also being environmentally friendly! Vintage Wedding Decorations For 2019: Fall in Love Today! 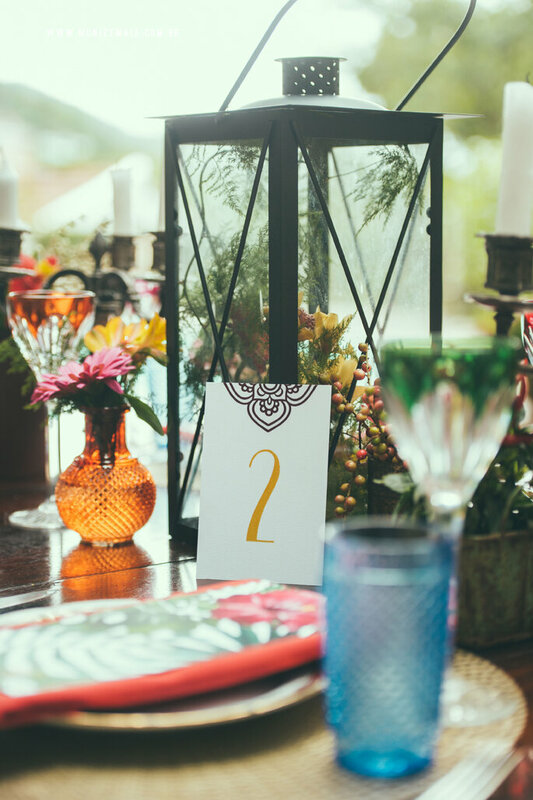 Vintage is always in, so choosing it as the theme for your wedding day means you're sure to be in style! Check out our favourite looks for the big day. A ceremony on the beach has to be the most exotic and romantic way to get married, so get inspired for your decoration with our latest gallery here! Find Inspiration For Your 2019 Outdoor Ceremony Here! Getting married outdoors is always a fantastic option for Spring and Summer weddings, so check out our inspiration for your decoration today! Top Decoration Trends For 2019: Make Your Ceremony Spectacular! Getting to that stage of the planning when you need to choose a style for your ceremony decor? Then get inspiration today! 11 Most Popular Wedding Styles This Season: Don't Miss Out! We draw your attention to two main aspects: concept and idea. Provided that you work through these two points that are fundamental for any wedding celebration, your wedding day is sure to be a success.